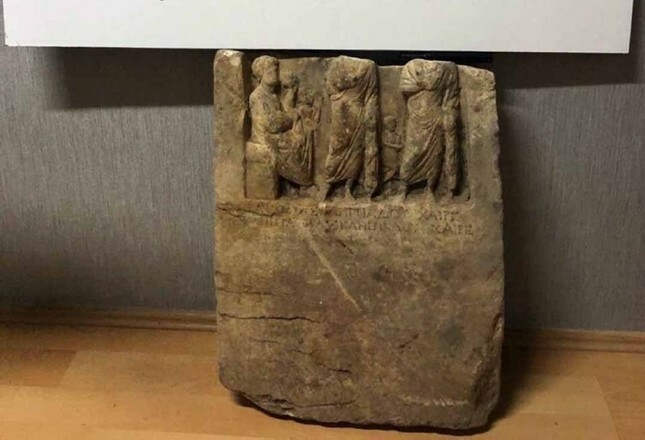 Anti-smuggling police seized a 2,000-year-old tombstone belonging to an ancient Armenian king in Turkey's northwestern Balıkesir province on Tuesday. Thousands of anti-smuggling operations are carried out across Turkey every year to halt the illegal sale of historical objects and protect the country's rich cultural heritage. The issue is crucial to a country that is home to about 3,000 ancient cities from 42 civilizations and whose tourism industry relies on its rich historical heritage to attract millions of foreign visitors each year. Kingdom of Commagene, a Hellenistic era state located on southeastern part of Anatolia is one of those ancient civilizations which existed from 163 B.C. to 72 A.D. The famous Mount Nemrut that contains Commagene Kings' statues is inscribed on the UNESCO List of World Heritage.